Three wind turbines, much like the above, would be installed off Spiddal, the closest being 1.7km from shore. #PowerFromTheSea – The Irish Times reports that the Marine Institute hopes to install wind turbines in Galway Bay for an offshore renewable energy trial. 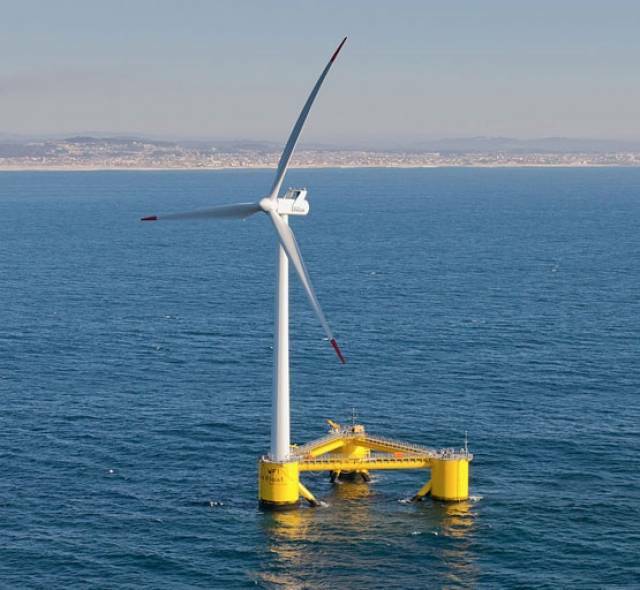 Permission is being sought for up to three turbines, with a maximum height of 35m above sea level, that would be installed at different times at the current ocean energy test site off Spiddal, along with a prototype offshore power generating station that would cover an area of 37 hectares. The entire project is open for public consultation. The Irish Times has more on the story HERE. Latest public observations are to be found on the Protect Galway Bay’s Wild Atlantic Waves facebook page. Application (FS006566) is for a Foreshore Lease ‘to construct an Electricity Generation Station’ in Galway Bay. This licence would allow this project to proceed without an environment impact report. The Foreshore Lease one year extension on the Galway Bay Test Site expired on the 19th March 2017. No news so far on the granting, or otherwise of the 35 year Foreshore Lease. The wave device on the test site was removed in the last two days; the owner of the devices said it was removed as the lease was not being renewed; the Marine Institute informed the public it was because the testing was over. Regarding the current 35 year foreshore lease application: It has come to light that the NPWS (under the aegis of FG Minister Humphreys) was under the impression that an NIS statement was being prepared for the application in question. There is no NIS with the application. The NPWS has been made aware, repeatedly, of this omission which could result in serious negative impacts on Natura 2000 protected sites. However, the NPWS refuse to confirm that they have now informed the consenting authority, FG Minister Coveney’s office, of this serious omission by the applicant, the Marine Institute – also under the aegis of FG Minister Coveney). The NPWS are responsible for the protection of the Natura 2000 Networks and for advising planning authorities if, and how, a project may proceed complying with environmental legislation. In this case, one wonders why FG Minister Humphreys is satisfied (as stated by her in the Dáil) that her department (NPWS) has failed to advise FG Minister Coveney of the above concerns, and that an appropriate assessment (and and EIA) is necessary in order for the application to comply with National and EU legislation? Why did the NPWS not comment on the lack of a Natura Impact Statement (NIS) and/or the lack of an Environmental Impact Statement (EIS), (both defined in law), in its observations advising on the protection of surrounding Natura 2000 Networks in relation to the Foreshore Lease Application FS006566 to ‘Construct an Offshore Electricity Generating Station’ on Galway Bay, since the screening process identified likely significant effects on the integrity of European Natura 2000 sites? Why did the NPWS not include concerns regarding in-combination effects an project-splitting in its observations to FG Minister Coveney’s department (DHPCLG) regarding the 35 year Foreshore Lease Application FS006566 to ‘Construct an Offshore Electricity Generating Station’ on Galway Bay? Can it be confirmed that the NPWS, as a basic responsibility of an agent of the state, has acted diligently to ensure that their decisions in the exercise of their functions comply fully with their legal environmental obligations, and has informed FG Minister Coveney’s department (DPHCLG) of the above concerns which would have serious negative implications for Natura 2000 sites.